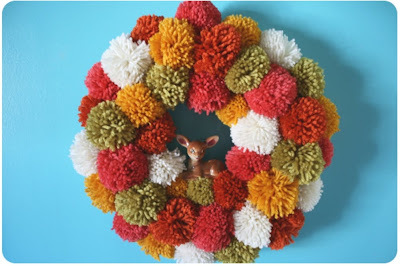 Oh...I can't tell you how happy the discovery of this DIY Pom Pom wreath made me. When I saw it I immediately remembered how my friends and I in grade school would spend hours making a bunch of pom poms. For what? Anything really. We'd make some for pinning on our coats or you know...the small friendship ones that you'd attach to your shoe laces on your favorite high tops. Okay so I just dated myself with that! Head over to bleubird to get the low down on making this fun wreath. I think I'm going to break out yarn colors of my daughters room colors and make one to hang up in there. I'm so giddy over this project!! !